The Towering Pile: Happy news! So, I have an excuse for not posting in a little while. I'm engaged!!! So, I've been a little wrapped up in wedding planning lately. I'm not getting married until September 2013, but it turns out that venues book up like a year and a half in advance, so already there are places with no free Saturdays in that month! Therefore, finding a venue is currently the urgent part of my planning! Congrats! 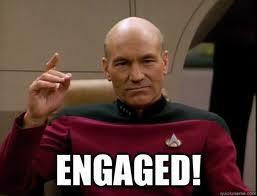 I certainly want to see posts of wedding planning :) I guess I'll have to hop over to your pins then. I love it! I'm super happy for you. You are going to have a blast.